Edison was born on February 11, 1847, in Milan, Ohio. After only a few months of formal schooling at age eight, he received the rest of his education at home from his mother. Fascinated by chemistry, he set up a laboratory in the basement at age 10 and began a life of innovation and experimentation. At age 12 Edison worked aboard a train selling magazines and snacks and spent his free time reading and working in his laboratory. About this time he began to lose his hearing, and he remained nearly deaf for the rest of his life. He settled in Boston in 1867, where his spare moments were spent inventing. Reading about the electrical experiments of MICHAEL FARADAY, he was inspired in 1869 to construct a device for recording votes electrically, an invention that attracted little attention. Edison moved to New York City later that year, where after brief but lucrative employment as a technical manager, he formed his own instrument­design company. He invented a stock­ticking machine, which was bought by a telegraphic company for $40,000. With the money Edison built an “invention factory” in Newark, New Jersey, which produced about 200 minor devices in seven years. In 1876 he opened a larger plant at Menlo Park, New Jersey, where he improved ALEXANDER GRAHAM BELL’s recently patented telephone by adding a carbon granule microphone that increased the volume of the transmission considerably. Edison patented the first phonograph in 1877. It consisted of a steel stylus that transferred sound vibrations to a cylinder wrapped in tin foil; the machine could record and reproduce sounds. The phonograph clinched Edison’s fame. The following year Edison began experiments to develop an incandescent light bulb. English physicist Joseph Swan had been investigating the plausibility since the 1850s. He knew that when an electrical current passes through a thin wire, the wire heats up because of the resistance met by the current, and the wire glows (reaches incandescence) when it becomes hot enough. But he had not overcome the problem that wires oxidize, or burn up, when they get hot. Creating a vacuum inside the bulb would have prevented oxidation, but in Swans time vacuum technology was insufficiently advanced. Edison worked tirelessly to solve these problems. In 1879, using cotton thread as the filament, he was able to produce light inside an evacuated bulb (vacuum technology had improved) for 45 hours, and after trying 6,000 types of material, he found a bamboo fiber that could produce 1,000 hours of light. He also drastically improved the necessary generating, switching, and transmitting devices to power a number of light bulbs simultaneously and established the world’s first power station in New York City in 1882. While experimenting with electric light, Edison noted the phenomenon, now known as the Edison effect, in which a small electric current flows from a heated filament to a nearby electrode, or wire. About 1887 Edison invented the kinetograph, an early form of the motion picture, involving a series of photographs mounted on a strip of celluloid film run through a separate projector. In 1903 he produced The Great Train Robbery with this technique. During his later years Edison made contributions to the technology behind the lead storage battery; the mimeograph machine, the dictating machine, the fluoroscope, and the production of cement. The recipient of numerous awards and honors, he died on October 18, 1931, in West Orange, New Jersey. Edison is widely recognized as one of the most influential and prolific inventors of the Western world. With the introduction of electric illumination and various elements of communication and entertainment, he influenced the technological and cultural shape of twentieth­century society. Edison’s incandescent light bulb revolutionized domestic electric lighting, which created demand for public electricity supply. This supply was delivered by Serbianborn American inventor NIKOLA TESLA, who introduced alternating­current generators. Although Edison built the first power station, his system utilized direct current, which was limited to local use. Tesla’s alternating­current generators allowed strong electrical currents to travel long distances and were therefore ideal for large­scale power transmission. Alternating current eventually became the primary method of supplying cities with electricity throughout the world. The discovery of the Edison effect was prerequisite to the development of electronic instrumentation. In 1904 English inventor John Fleming built upon the Edison effect to devise the electronic vacuum tube, later called a diode, a device that could amplify electric audio signals and that could generate, amplify, and detect radio waves. The diode made long­distance telephone connections possible and was at the heart of early radio and television broadcasting. It was also important in the development of the computer. 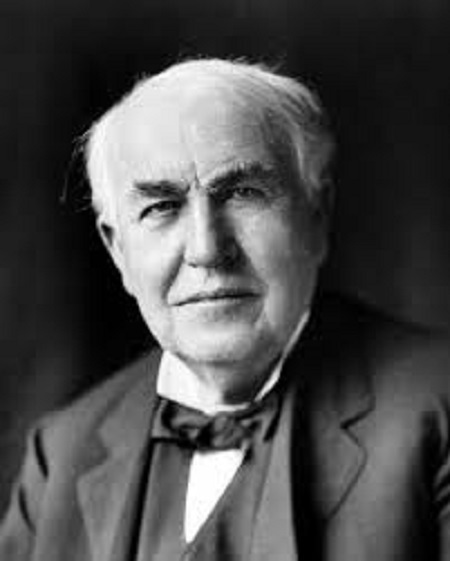 Although Edison did not fully develop the phonograph and kinetograph (seeing little commercial future for those devices), his inventions provided the prototypes and inspiration for modern music and film production. Posted on March 7, 2015 by Natalie. This entry was posted in Inventors. Bookmark the permalink.